Doha Green belt scenarios, Albandari Alharami, Heba AlGuhani, Hessa Al Hajri, Maryam Abbara, Qatar University. © Qatar University. Dohasis is a vision for Doha’s Blue Biourbanism. 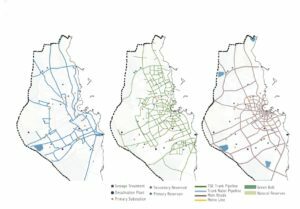 Its tactical acupuncture projects are potentially implemented through interventions in available existing spaces, creating a restorative ecological ripple effect throughout the entire city. 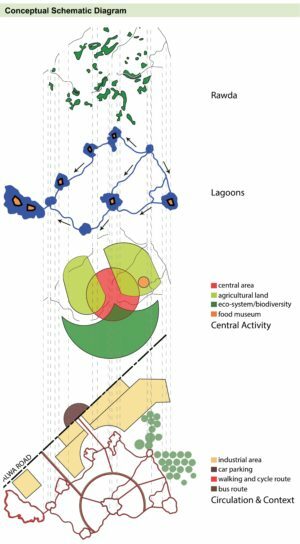 The research and design methodology of Dohasis will combine the theories and practices of Urban Acupuncture (Casagrande), Swarm Planning (Roggema) and Blue Urbanism (Grichting). 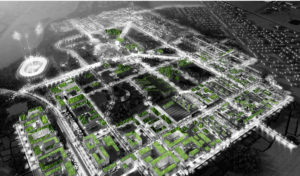 The target is a flexible city coexisting in harmony with the different pulses of nature, especially the sea, taking into account the opportunities rising up with climate change, but also rainwater events, providing the chance for the regeneration of dust storms with the opportunity to harvest soil materials from elsewhere for the benefit of bioregeneration of spaces in the city. Doha TSE Lagoons and Agricultural Park, layers, Mooza Al Mohannadi, Sara Nafi, Samar Zaina, Sara Zaina, Qatar University. © Qatar University. Doha Green Belt and Green Network Systems, Abandari Alharami, Heba AlGuhani, Hessa Al Hajri, Maryan Abbara, Qatar University. © Qatar University. We propose to collaboratively build up a visionary plan for future Doha Blue Biourbanism and a series of realisation plans in the form of tactical acupuncture projects which can be implemented in current urban conditions through interventions in available spaces, which will have an ecological restorative ripple effect swarming throughout the entire city. Seascapes Aquarium, Jawaher Al-Kaabi, Qatar University. © Qatar University. Qatar University Edible Campus Green Roofs. Students ARCT421. © Qatar University. Seascapes Aquarium, night view, Jawaher Al-Kaabi, Qatar University. © Qatar University. Doha’s current city centre and urban sprawl is producing a high density and high volume of organic material streams which are not used for the ecological cycles within the built human environment. With some rethinking, these organic streams (grey water, sewage, organic waste, urban runoff and storm waters, materials brought to the city during dust storms) offer great potential to transform Doha into a man-made oasis: Dohasis – Blue Doha. 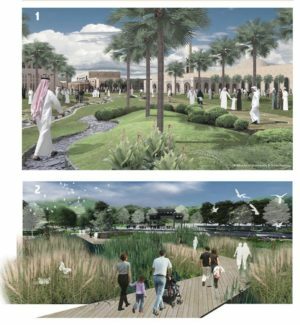 By combining modular environmental technology, open form infrastructure and landscape urbanism these material streams can become a steady source of power for the new organic layers of Doha City: parks, trees, water elements, wetlands, green roofs, wild nature, urban farms and collective gardens. By enhancing the greenery and urban oasis effect of Doha these organic layers will reduce the heat island effect of the city, produce a comfortable micro-climate, and create an attractive public entourage and encourage for pedestrian movability – a new urban ecological luxury. Capturing the rising amount of rain, storm waters and dust is a valuable process to establish new urban organic layers. The sea becomes an active part of the cityscape through the introduction of a series of controlled cracks in the flood defense walls and the design of free water movements within open spaces of the city. This new condition will prepare Doha to deal with the future rise of the sea level and changing weather conditions. 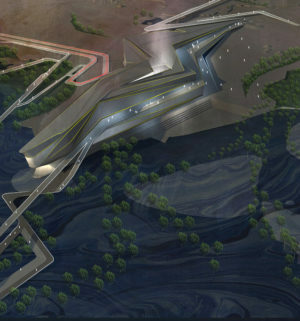 The urban water elements will also act as storm-water relief channels and contribute to the microclimate of the city. New mixed fresh and salt water greenery will be introduced in urban conditions, partly developing Doha into an urban mangrove and inviting back original site-specific forms of flora and fauna. The future biourban development of Doha as a Dohasis must be connected with the collective conscious and subconscious knowledge and understanding of the different layers of the existing communities. This local knowledge will resurface at street level once industrial control is opened up in order to let nature – including human nature – to step in. The new organic development of Doha will also create new local knowledge as a key element for the ownership of the share-holders of the organic future. We would like to propose a presentation of tour ideas to a panel of local administrative representatives from the ministries and municipal departments, in the fields of flood protection, urban planning and design, and nature and ecology, who are in charge of developing future thinking in policies and plans for a future sustainable and resilient Doha.